Israeli President & DR President hanging out? 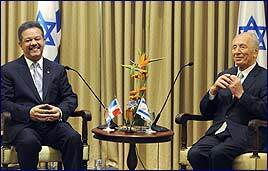 What is Israeli President Peres doing meeting with the President of the Dominican Republic, Dr. Lionel Fernandez? Well having a Jewminican conference, of course. Now, how come I wasn’t invited?